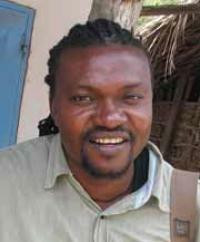 Haji Chilonga was born on January 24th, 1969 at Lukuledi in south Tanzania. He comes from the pottery and blacksmiths family background. As he was interested in drawings he earned his money from painting commercial advertisements. 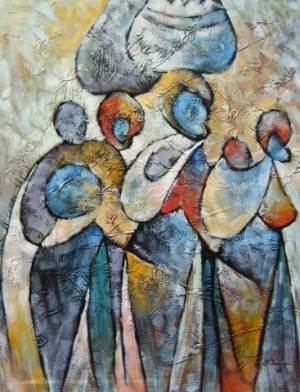 He became a serious painter in the year of 1992 when he was tutored by more experienced artists. At this time when Chilonga started to paint he drew a few artist to himself. For instance he tought Aly Kitogo and he considerably influenced Florian Ludovick. All these three painters had very similar style but as time went and experiences grew up all found their own personal style. Each painter developed his own distinctive imprint. 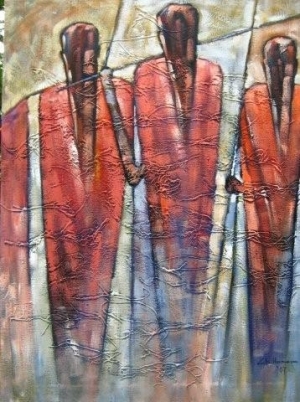 Chilonga´s paintings talk about local life situations. Chilonga paints also portraits. First exhibition took place in 1995 at Bamayu Gallery in Tanzania. He exhibited the art works in Tanzania, Kenya, Uganda, South Africa, Germany, Switzerland, Austria, USA and Canada. He participated on 3 international art workshops and 4 Solo exhibitions. Recently Chilonga´s style was picked up by a very skillful young artist Thobias Minzi who had some success at AFRICA/NOW exhibition. Much to dismay of Chilonga. Recently Haji Chilonga visited USA and we hope we will get some interesting observations from him on AFRUM.